Please send application, resume, and copy of certification (if applicable) to humanresources@sccak12.net by April 17th. 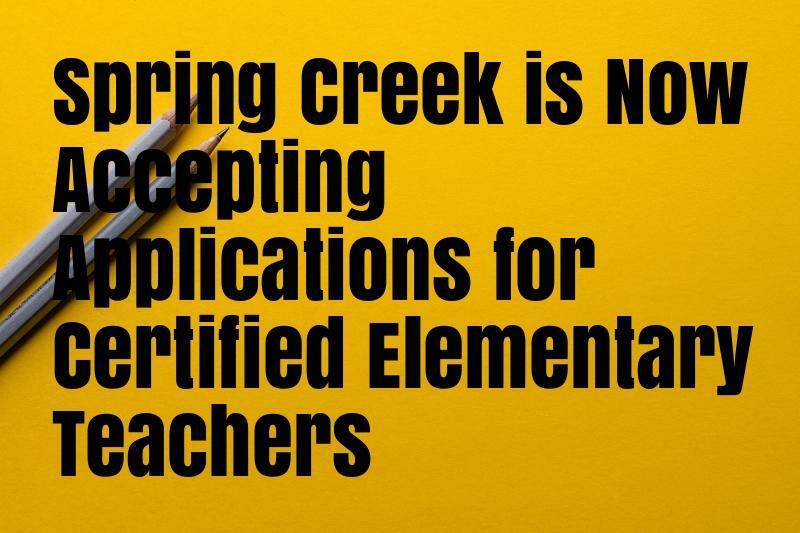 Spring Creek Charter Academy is a new charter school opening in fall of 2019 seeking Early Childhood Certified Teachers. This is an exciting opportunity for teachers who thrive in an innovative and challenging environment. The school will use project-based learning, standards-based grading and reporting, and other innovative strategies from the Expeditionary Learning model. For more information on the school’s educational model, visit www.pataula.net. Spring Creek will open in fall of 2019 with grades K-5 and add one grade level per year until 12th grade. The school is a public Commission Charter School based on the successful model of Pataula Charter Academy in Edison, GA. The school will serve students in Decatur, Miller, and Seminole counties. The school will be located in Bainbridge, GA. Please send application, detailed resume, and a copy of teaching certificate to sccahr@pataula.net by Friday, February 15th. You may ask for additional information or questions using this email as well. We will not be accepting any calls regarding this position until resumes have been received and reviewed. A new public charter school based on the successful model of PCA will be opening in Fall 2019. This new charter school's attendance zone will include Decatur, Miller and Seminole counties. The location for the school is not yet finalized, but now that we have received official approval that will be top priority. Pre-enrollment forms will be released in November and the lottery for enrollment will be held in February. We will also likely start taking applications for employment in January. If you have questions about SCCA, please email them to springcreek@pataula.net. SCCA PRE-ENROLLMENT FOR THE 2019-2020 SCHOOL YEAR IS NOW OPEN. We will be using an online platform for pre-enrollment and our lottery to ensure accuracy and transparency in the enrollment and lottery process. The link below will be used to submit a pre-enrollment application. (For people without internet access, paper copies will be available upon request.) The deadline for submission of pre-enrollment is Thursday, February 21st at 3PM. The lottery will be held Saturday, February 23 at 10AM at the Kirbo Center in Bainbridge. *The deadline for submission of pre-enrollment has been extended to Thursday, February 21st at 3PM. The lottery will be held Saturday, February 23rd at 10AM. We have extended the enrollment period to ensure thorough marketing and outreach to all communities. *The plan has always been to serve only grades Pre-K-5th in the first year. However, we included middle school in our interest survey to see how many families with older siblings would be effected by not offering higher grades. We are still unsure if adding 6th grade is in the best interest of the school. Research shows that starting small and growing slowly is best for charter schools. However, feedback from many parents has been that a 6th grade is needed to keep families together. Therefore, we have added 6th grade to the pre-enrollment application. This does NOT guarantee that we will open with 6th grade. We are still simply gauging interest with this. The Board will vote prior to the lottery to add 6th grade IF we feel that is a viable option. *We also want to be clear that Pre-K is not part of the charter. We will have to be approved by DECAL for a GA Pre-K, and will not know that until next summer. Also, since Pre-K is not part of the charter we cannot guarantee continuous enrollment from Pre-K to Kindergarten. All Pre-K students will have to go into the lottery for Kindergarten. Below is the Lotterease Parent Manual to help with the pre-enrollment process. If you have other questions or need a paper copy of the pre-enrollment application please send them to springcreek@pataula.net. *Below are a few documents for you to learn more about Spring Creek Charter Academy.